…and how we might try to create them. 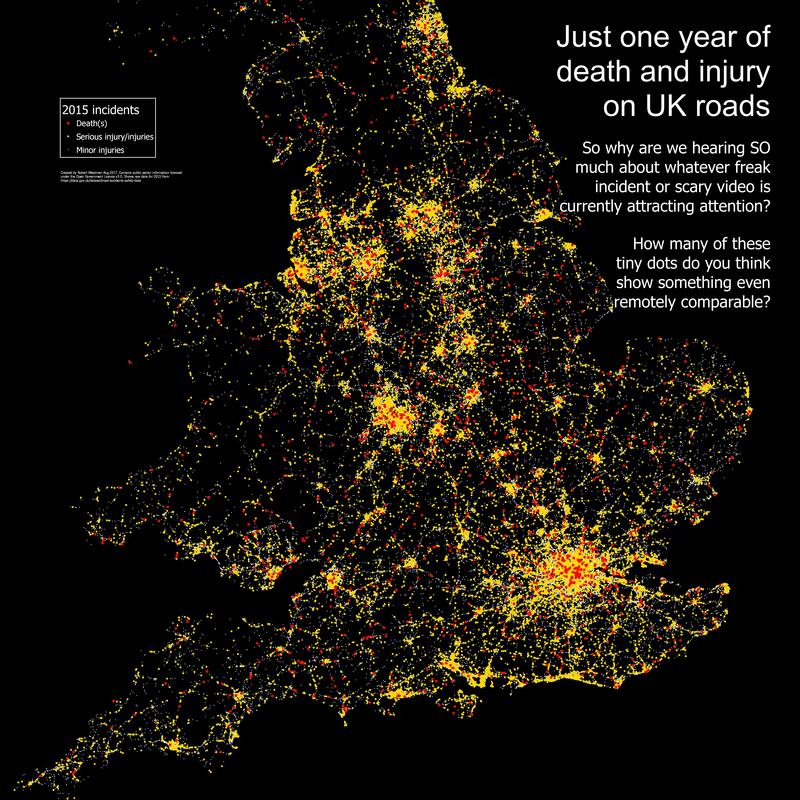 The image showing a map of death and injury on British roads attracted attention when I tweeted it, so here are a few more images, and a little bit of explanation. August 2017 saw a furious and extraordinary onslaught of anti-bicycle-user rhetoric in the UK – driven not just by the more extreme ‘newspapers’, but by supposedly serious channels and outlets too. What sticks out for me is that this is the ‘cyclist’ as scapegoat. This is ‘divide and rule’ at its most simple, and effective. If those on foot can be encouraged to direct their anger at those cycling… and those cycling get angry in return… then we’re all distracted from the real problems. 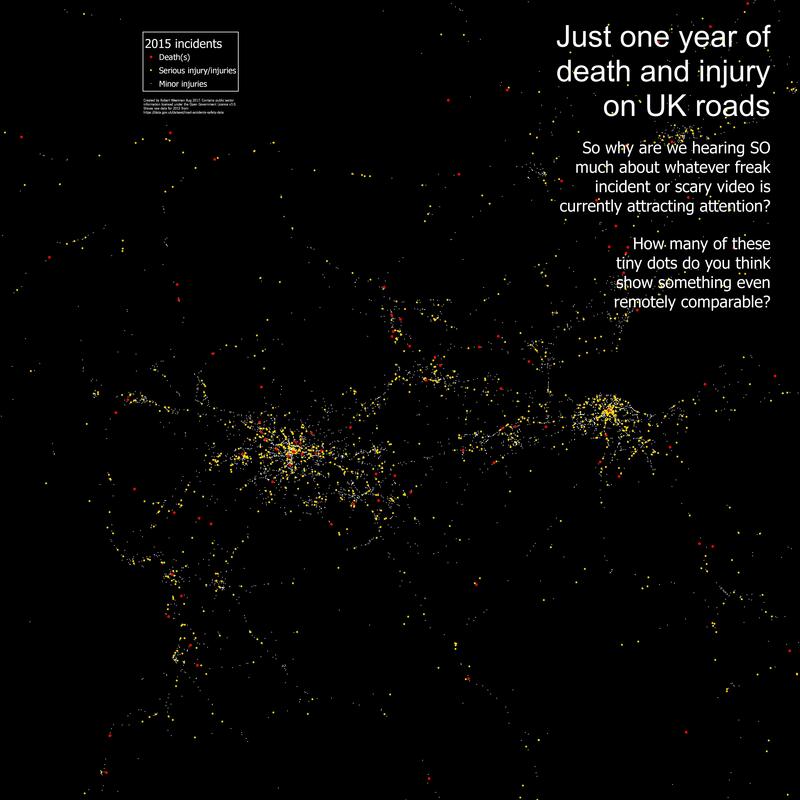 All of the images in this article are based entirely on the ‘Stats19’ data for Great Britain for injury and death on the roads of Great Britain during 2015, using the categories of injury which are provided in this data. The original data is available here for anyone who wants to replicate them. See below for a disclaimer. The very tiny white dots on my images represent minor injury. The orange dots something serious. And the red dots represent people who died. The images below show all of the data – each injury or death from the data, no matter how caused. The first image is of England. The second is the whole of Great Britain. The third is zoomed in to Scotland (but because of the population density this is a less striking image and I’m only including it here for completeness). Note: There are links below the images to high resolution versions. You may need to click the back button, or close a tab, to return to this article. 2015. Death and injury. GB roads (England). 2015. Death and injury. GB roads (whole Great Britain). 2015. Death and injury. GB roads (Central Scotland). What’s really shocking is that I don’t need to put these dots on a map. The numbers of people being killed and injured allow you to actually pick out the roads and cities. My point, today, is not actually about the levels of death and injury on the roads of Great Britain. My point is that any discussion about any one incident, particularly if it’s a really unusual one, has to take place in context. Let’s make no mistake. A collision between someone on a bicycle and someone on foot can be a serious thing. Very rarely it is the case that people actually die this way, although it has to be remembered that it can be the person cycling who is most badly injured. This is why the way that the Netherlands thinks about people cycling is so sensible… In the cities those on bicycles are regarded as a very separate category of road user. Bicycles belong in their own space on busier streets, away from the risk from vehicles AND away from the risks caused by mixing with those on foot. For a quick run-down of how things work there this article by Mark Treasure is a decent starting point. But what level of risk am I actually at from being hit by someone on a bike when I’m walking? How does this compare to my risks from other vehicles? Well below is a simple animation which switches between two maps. These images show anyone recorded in the data as a ‘pedestrian’ who was injured or who died. The symbols – tiny white ones, orange and larger red ones – have the same meanings as above. The data indicates what kind of vehicle was involved. The difference between the two images is that ‘Map A’ EXCLUDES situations involving a bicycle, and ‘Map B’ INCLUDES situations involving a bicycle. (Note that the data does not indicate much detail about the incident, so I’m being careful not to imply who was at fault, or that one road user hit another or vice versa). You’ll need to look closely to see the difference. That’s the point of course. Once you start to look in more detail at injury involving those classified as ‘pedestrians’ and those on bikes the images aren’t as dramatic. But the comparisons can still be striking. Here’s one final animation (for the moment). This switches between four images. 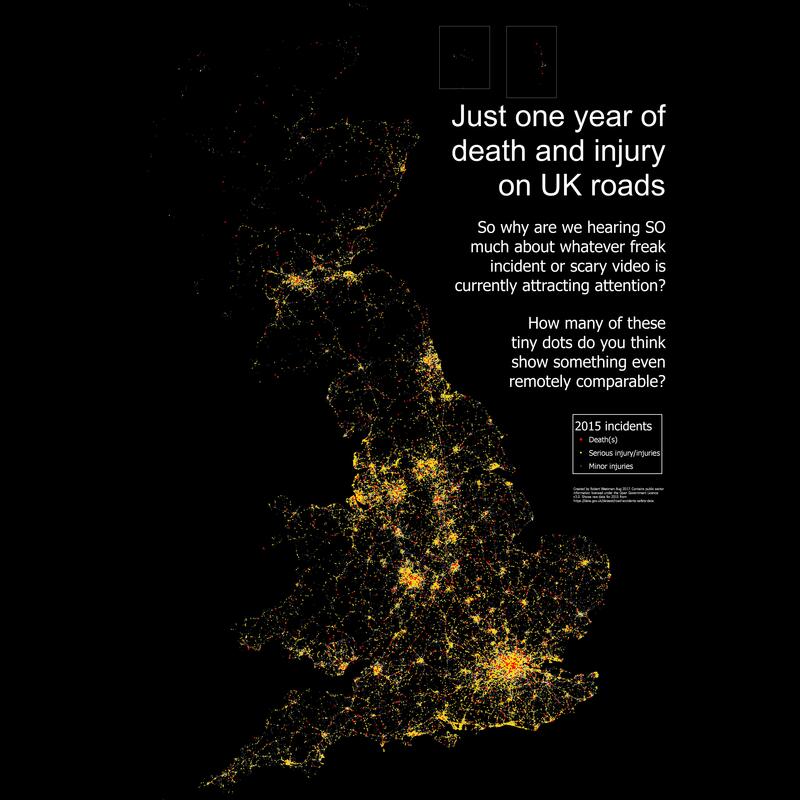 They all show injuries to people the data classifies as pedestrians – across almost all of Great Britain (the area north of about Inverness is excluded). You can view this as a slower animation if you wish. What other images would be helpful? Read everything – New here? This is a suggested reading order. Please note that this is the first time I’ve plotted images from the Stats19 data. The images have not been independently checked for accuracy, and errors are possible. Please let me know if you spot any. Worth noting ACPO assessment of under reporting for STATS19 especially minor injury and single vehcle collision with this especially for cycles. Any good links on that? I’m aware of the issue, but not aware where to find the best assessment of it.